Today you can get the popular "Mind Games Pro” Android game worth $4.99 for Free on Amazon’s android appstore. "Mind Games Pro” developed by Mindware Consulting, Inc. has a 4.4/5 star rating on Amazon and is listed as #1 in Amazon’s “Best seller Game Apps”. 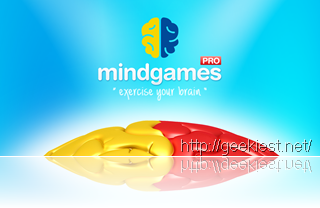 Mind Games is a great collection of 19 brain exercising games to help you practice different mental skills. Based on principles of cognitive psychology this game helps you not only to fight the effects of aging on your brain but also to improve brain functioning for any age. Given a puzzle game, Mind Games Pro shows you score history and graph, as well as standardized scores and percentile ranking. Remember this is a time-sensitive offer and will expire soon. So act fast to grab this offer. NOTE from Developer: The Avast virus scanner incorrectly identifies this app as having potential malware. We have examined the issue and found this to be a false positive error of the scanning software. Please verify with any other scanning software.